The aim of this study was to observe the effect of foliar fertilization with organic products on the nutritional quality of fruits stored. The time between harvest and consumption of fruits and vegetables, may be up to several weeks. In this regard, the storage capacity of tomato fruits at three hybrids has been studied: Antalya, Chocolat and Tiger. The culture was founded in a greenhouse in the south-west of Romania. The fruits were stored at a temperature of 15°C ± 0.5°C and a relative atmospheric humidity of 82% for a period of 42 days. In order to assess the nutritional fruit value during storage, biochemical analyzes were carried out at 7, 21, 35 and 42 days. Experimental results have shown that the best variants of organic manure and storage time, which positive influenced the content of carotene and vitamin C were variants with humic acids + Vitis vinifera seeds extract and humic acids + extract from the seeds of Vitis vinifera + Boro. Key words: Tomatoes, vitamin C, total carotenes, titratable acidity. El objetivo de este estudio fue observar el efecto de la fertilización foliar con productos orgánicos sobre la calidad nutricional en los frutos almacenados. En este sentido, la capacidad de almacenamiento de los frutos de tomates ha sido sometida a tres híbridos: Antalya, Chocolat y Tiger. Los tomates han sido cultivados en un invernadero, en la parte sur-oeste de Rumanía. Los frutos se han guardado a una temperatura de 15°C ± 0.5°C y a una humedad atmosférica relativa de 82%, durante un período de 42 días. Para la evaluación nutricional de los frutos durante el periodo de almacenamiento, se realizaron análisis bioquímicos a los 7, 21, 35 y 42 días. Los resultados de los experimentos mostraron que las mejores fórmulas empleadas en la fertilización orgánica, así como el tiempo de almacenamiento, que han influido positívamente en el contenido de carotenos y vitamina C, han sido: la fórmula con ácidos húmicos + extracto de semillas de Vitis vinifera y la fórmula con ácidos húmicos + extracto de semillas de Vitis vinifera + Boro. Palabras clave: Tomates, vitamina C, carotenos totales, acidez titulable. The tomatoes (Lycopersicon esculentum Mill.) are one of the vegetable most consumed worldwide because they are the main supplier of several phytonutrients that provide important nutritional value for the human diet (1). An average consume of tomatoes provides 40% of the recommended daily allowance of vitamin C (ascorbic acid), 20% of the RDA of vitamin A, substantial amounts of potassium, dietary fibbers, calcium, and smaller amounts of iron, magnesium, thiamine, riboflavin, niacin, and it contains only about 35 calories. The regular consumption of fruits and vegetables was associated with the maintenance of health and prevention of diseases. The tomatoes are an important species due to the major contribution of carotenoids, phenols, vitamin C, vitamin E that come in daily ration of nutrition of the world population . The results of different studies showed that tomatoes and products obtained from tomatoes may have a protective effect against various diseases such as prostate, cancer and cardiovascular diseases (2). Several studies have shown that during ripening important changes occur in the synthesis of pigments (e.g. of lycopene). Some authors like (3), reported an increase in the content of ascorbic acid during ripening, and argue that the main antioxidants in tomatoes are the carotenoids, ascorbic acid and phenolic compounds. The entire antioxidant activity of tomatoes varies considerably depending on the variety, on genetic information, maturing stage and growing conditions (4). There is a wide variation in the content of vitamin C among tomatoes varieties. The carotene content is greatly influenced by the type of culture (5) and by the fertilization that is made during vegetation. Humic acids in combination with other products represent an important source of natural organic matter in agricultural fertilization. The action of polyphenols in plants is distinguished by their role in the formation of pigments, in growth, for their the resistance to pathogens and for UV protection (6). Studies in scientific literature show a varied effect of applications of humic acids simple or in combination with other stimulators. Fertilizer applications based on humic acids on tomatoes grown in greenhouses positively influence the qualitative and quantitative characteristics of the fruit (7). Other studies show that humic acids applied both on the root and foliar on a crop of peppers, determine a higher yield and better quality fruit that can significantly increase the content of capsaicin (8). An important role in the development of plants plays also the boron influencing the synthesis of aromatic compounds, the permeability of protoplasmic membrans, translocation of carbohydrates, division of cells, fruit maturation, accumulation of free auxin and biosynthesis of nucleic acids (9, 2). A deficit of boron in plants and soil leads to a decline in plant vascularization, root elongation, slowdown in the metabolism of carbohydrates, reduction of the synthesis of nucleic acids etc. (2). In its absence leaves become vulnerable, begin to twist inward, flowers fall and fruits start to smudge (starts tissue damage). The tomatoes metabolism continues even after the removal of fruits from the plant when fruits are red, then reaching a point where they become devoid of nutritional value . To extend the life of fruits and vegetables, on the shelf, and to slow down the respiratory metabolism during storage, these are stored at low temperatures in an atmosphere of carbon dioxide (10). The production quality after harvesting is done during the growing season and could be maintained, but not enhanced by post-harvest technologies. This can be achieved through a selection of genotypes with a better quality at storage, at harvest and at optimum maturity (11) indicated that the genetic material available on the market allows the discrimination of external and internal attributes of quality that must meet the consumer demands. The aim of this study was to observe the dynamics on days of storage, the nutritional value of the three hybrids of tomatoes fertilized in vegetation with organic products. The experiment of the tomato crop was created in the didactic field of Horticulture Faculty of Craiova, Romania (44°19’ North latitude and 23°48’ East longitude), in an un heated greenhouse, and the biochemical determinations were performed in laboratory. Antalya, Chocolat and Tiger tomato hybrids were studied. The experiment was bifactorial located in randomized blocks, with five variants of 3 repetitions/each variant. The first factor (A) was the fertilizing product assortment with five graduations: a1 – control without fertilizing; a2 - Vitis vinifera seed extract (Vv.Se); a3 - humic acids (HA. ); a4 - humic acids + Vitis vinifera seeds extract (HA+VvSe); a5 - humic acids + extract from the seeds of Vitis vinifera + Boron (HA + VvSe + B) and the second factor (B) was the storage life with also five graduations: b1-without storage (at harvest), b2-storage for 7 days, b3-storage for 21 days, b4- storage for 35 days and b5- storage for 42 days. The bio-fertilizer was applied to foliage at a concentration of 1% humic acids and 1.5% for the variants with polyphenolic and boron extract. The first foliar treatment was applied at 2 weeks after planting, and the following treatments at an interval of 14 days. The fruits from three tomato hybrids that were different between them by colour were used in the study. Antalya hybrid has red fruits, Chocolat hybrid has chocolate brown fruits and Tiger hybrid has red-green fruits. The fruits for laboratory samples were collected manually at physiological maturity. They were brought from the field in the laboratory where they were washed with tap water to remove the field heat, soil and to reduce the microbial populations on their surface and then they were stored in ambient conditions. Each hybrid had a sample of 90 fruits per repetition, which were assessed throughout the storage period. They were kept at a constant temperature of 15 ± 0.5°C for 42 days. In this interval there were determined the content of vitamin C, total carotene and titratable acidity to see the evolution of these elements during storage. A sample of 5-10 g of tomatoes, previously ground with quartz sand has been put into a 100 ml- balloon by using a solution of 2% hydrochloric acid. It has been stirred and after sedimenting it has been filtered into a dry glass. A 10-ml aliquot has been passed into a Berzelius glass, to which 30 ml of distilled water; 5 ml of 1% potassium iodate and 1 ml solution of starch have been added. It has been then titrated with potassium iodate N/250 stirred until becoming bluish (2). G – the sample weight in grams. The weighed samples, having been put separately in 95% in acetone (50 ml for each gram), were homogenized with Braun MR 404 Plus for one minute. The homogenate was filtered and was centrifuged using the Hettich Universal 320/320R centrifuge at 2500 rpm for ten minutes. The supernatant was separated and the absorbencies were read at 400-700nm on Cary 50 spectrophotometer. It was recorded that Chlorophyll a showed the maximum absorbance at 662 nm, chlorophyll b at 646 nm and total caroten at 470 nm and the amount of these pigments was calculated according to the formulas. The determination of titratable acidity. From a sample of 5-10 g of tomatoes homogenated with a vertical blender Braun MR 404 Plus for 1 minute, 1-2 ml were taken which were diluted in 10 ml of distilled water and titrated with 0.1 N sodium hydroxide in the presence of phenolphthalein. In the storage room, the relative air humidity was 82%, in accordance to what was reported previously by (12). Therefore, the environmental conditions for storage had the temperature and relative humidity that did not affect the tomatoes during storage. During storage, in the study, the storage time significantly affects the chemical composition of the fruit at Antalya cultivar. The highest level of content in carotene, vitamin C and acidity was recorded by the variants b1-without storage, b2-storage for seven days, b3-storage for 21 days. For the b4 version, the values decreased for carotene and vitamin C while acidity increased. In the b5 version, storage for 42 days, the fruits degraded (Figure 1B) and did not have the nutritional value. For the Chocolat hybrid the highest values of vitamin C content were at a2 and a4 variants, and for carotene a4. Acidity recorded oscillations depending on variants (Figure 2A). After harvesting and storage for 7-21 days, these indicators values increased and then they started to decrease. Compared to Antalya, the vitamin C is also found in 42 days from harvest, but in small amounts (Figure 2B). 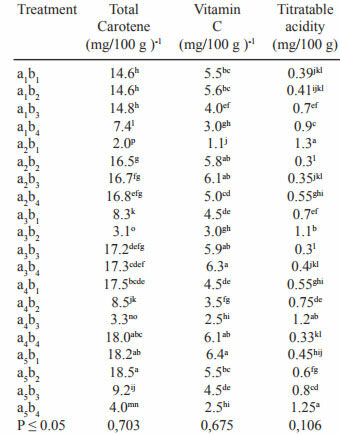 izer products and the storage period of fruits, the best carotene accumulation was recorded at a4b1; a4b2 and a4b3 variants and vitamin C was recorded at a4b2 variants, and for titratable acidity a1b5 (Table 2). For the Tiger hybrid the application of organic fertilizers significantly affected the accumulation of carotene and vitamin C, compared to the unfertilized plant. 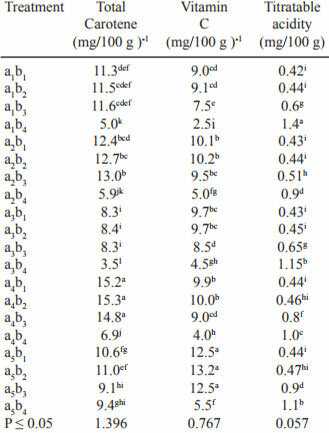 The best accumulation was in variants a5, a4 for the content in carotene, a2 and a4 for the content in vitamin C and for titratable acidity a1 (Figure 3A). 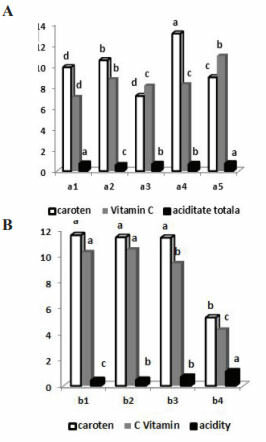 On storage period, there was a slight in-crease in vitamin C and carotene in 7-21 days of fruits storing and then slightly decreased (Figure 3B). The results are also confirmed by (13) who in their study recorded the same values for a period of 10 days of tomatoes storage. 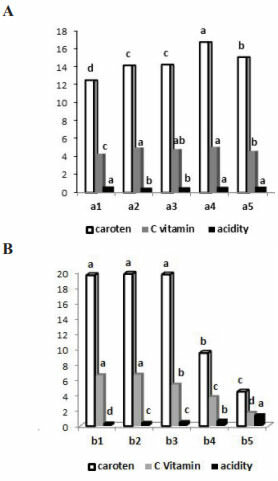 In interaction the best variants were a3b2 and a4b2 for vitamin C and for carotene the a4b3 version (Table 3). Generally at relatively low temperatures it is maintained the quality of fruit and vegetables due to the effects breathing intensity reduction, transpiration, ethylene production, maturation, aging and slime growth. It should be noted that towards the end of the storage period of tomato fruits, the vitamin C content decreases because the fruits reach the over maturation. This trend was consistent with the results obtained by Toor and Savage (13). There are cases where there were reported increases in vitamin C content during the final stages of the fruit maturation. For example Brecht et al (15) found a high content of vitamin C along with increasing maturity of fruits. The literature shows that the tomatoes fertilized during vegetation with organic products have a higher content of vitamin C than the non-fertilized ones (16). The difference between the hybrids in terms of the content of vitamin C, for the tomatoes for fresh consumption varied in our study similarly to the data reported by Toor and Savage (13). The tomatoes grown in greenhouse recorded lower levels of ascorbic acid than those grown outdoors due to the intensity of light which is smaller in greenhouses than in the culture on the open field (17). This could explain the relatively lower content of ascorbic acid at the studied hybrids. The lycopene represents 60-74% of the tomato carotenoids and of the tomato products. The lycopene content is affected by many factors such as maturity, variety (2), treatments applied during vegetation, the influence of environmental factors and especially of the heat. Depending on the stages of development, at the tomatoes at the immature green fruit stage until the physiological maturity stage, when the fruit is yellow-orange or deep red, the carotenoid content increases and it is related to the increased lycopene content in plastids. Our results showed that the carotene biosynthesis continues during storage, this being consistent with the results of (18). It increased from the harvest of 21 days of storage and then began to decrease at all the three studied cultivars. After Gyanendra et al (19) the content of carotenoids in tomatoes increases during storage due to progressing towards full maturity when chlorophyll degradation happens and there is increased synthesis of carotenoids. Increased levels of lycopene in tomato during storage might be due to ripening advancements of tomato fruits and conversion of chloroplasts to chromoplasts. This effect was also reported by Ajlouni et al (20) which registered increases in the content of lycopene in tomato fruits during storage at 22 °C for a period of 14 days. 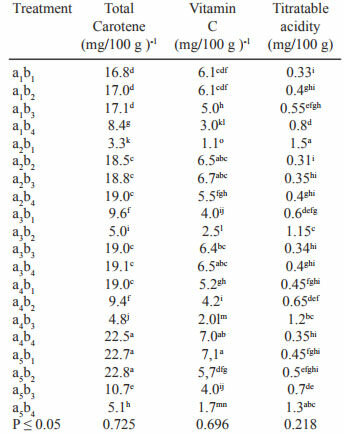 The titratable acidity in the present study ranged from 0.39 mg/100g at Tiger cultivar to 0.42 mg/100g at Antalya cultivar for the unfertilized variants. The latter cultivar forms larger fruits than the Tiger and Chocolate hybrids. This variation could be due to the difference in size of the fruits. After Tigist et al (12) showed that large tomato fruits had higher acidity, which is consistent with the results of our study. The titratable acidity continued to grow throughout the storage period and the results are similar to those obtained by (10, 21). According to Tigist et al (12) in a study on some tomatoes cultivars, stored for 32 days, the acidity increased only in the first 4 days of storage, and then decreased. Application of humic acids influenced significantly the quality of tomato fruit (7). Also, cumulative application of humic acids with potassium to a cucumbers crop in greenhouse has resulted in a significant improvement of the fruits (22). The same results were observed when humic acid was applied to an apricot crop which led to an increase in the content of T.S.S and decreasing fruit acidity (23). The best fertilizers on carotene content and vitamin C in the hybrids studied were a4 - humic acids + Vitis vinifera seeds extract and a5 - humic acids + extract from the seeds of Vitis vinifera + Boron. Applying fertilizers with humic acids combined with extract from the seeds of Vitis vinifera (a4) and extract from the seeds of Vitis vinifera + Boron (a5) determines a good accumulation in nutrient substances over the retention period up to 21 days of tomato fruits. In the interaction of factors organic fertilization during the vegetation period and storing time there were highlighted the variations a4b1, a4b2 and a4b3 in Antalya and Chocolat and a4b3 at Tiger, regarding the carotene accumulation, For vitamin C there were emphasized variants a5b1, a5b2 Antalya, a4b2 at Tiger and Chocolat. Willcox JK, Catignani GL, Lazarus S. Tomatoes and cardiovascular health. Crit Rev Food Sci Nutr 2003;(43):1-18. Dinu M, Dumitru MG, Soare R. The effect of some biofertilizers on the biochemical components of the tomato plants and fruits. Bulg J Agric Sci 2015;21(5):998-1004. Giovanelli G, Lavelli V, Peri C, Nobili S. Variation in antioxidant components of tomato during vine and post-harvest ripening. J Sci Food Agric 1999;(79):583–1588. Leonardi C, Ambrosino P, Esposito F, Fogliano V. Antioxidant activity and carotenoid and tomatine contents in different typologies of fresh consumption tomatoes. J. Agric Food Chem 2002;(48):723–4727. Zoran IS, Nikolaos K, Ljubomir S. Tomato Fruit Quality from Organic and Conventional Production. pp. 147-169 In: Organic Agriculture Towards Sustainability. Vytautas Pilipavicius (ed). In Tech Publisher, Rijeka, Croatia 2014. Lattanzio V, Veronica M, Lattanzio T, Cardinali A. Role of phenolics in the resistance mechanisms of plants against fungal pathogens and insects. Phytochemistry: Advances in Research. Editor: Filippo Imperato 2006;23-67. Yildirim E. Foliar and soil fertilization of humic acid affect productivity and quality of tomato. Acta Agr Scand B 2007;57(2):182-186. Karakurt Y, Unlu H, Ulnu H, Padem H. Foliar and soil fertilization of humic acid affect productivity and quality of tomato. Acta Agr Scand B 2009;579(2):233-237. Kalt W, Forney CF, Martin A, Prior RL. Antioxidant capacity, Vitamin C, Phenolics, and anthocyanins after fresh storage of small fruits. J. Agr Food Chem 1999;(47):638–644. Ramakrishnan K, Narayanan P, Vasudevan V, Muthukumaran G, Antony U. Nutrient composition of cultivated stevia leaves and the influence of polyphenols and plant pigments on sensory and antioxidant properties of leaf extracts. J Food Sci Technol 2010;47(1):27–33. Tigist, M, Tilahun SW, Woldetsadik K. Effects of variety on the quality of tomato stored under ambient conditions. J. Food Sci. Technol 2013;50(3):477–486. Toor RK., Savage GP. Changes in major antioxidant components of tomatoes during postharvest storage. Food Chem 2006;(99):24–727. Castro LR, Vigneault C, Charles MT, Cortez LA. Effect of cooling delay and cold-chain breakage on ‘Santa Clara’ tomato. J. Food Agric. Environ 2005;(3):49-54. Brecht JK, Bisogni L, Mungek HM. Effect of fruit position, stage of ripeness and growth habit on chemical composition of fresh tomatoes. J. Am Soc Hort Sci 1976;(41):945–948. Hoza Ghe. Research regarding the effect of foliar fertilization on tomato growth and fructification. J. Hortic Forest Biotech 2010;(1):257-260. Dumas Y, Dadomo M, Di Lucca G, Grolier P. Effects of environmental factors and agricultural techniques on antioxidant content of tomatoes. J. Sci Food Agric 2003;83(5):369-382. Brashlyanova BP, Ganeva PD. Colour parameters during cold storage and ripening of tomatoes. Acta hortic 2009;(830):345-348. Gyanendar KR, Rajesh K, Singh AK, Rai PK, Rai M, Chaturvedi AK, Rai AB. Changes in antioxidant and phytochemical properties of tomato (Lycopersicon esculentum Mill.) under ambient condition. Pak. J. Bot 2012;44(2):667-670. Ajlouni S, Kremer S, Masih S. Lycopene content in hydroponic and non-hydroponic tomatoes during postharveststorage. Food Australia 2001;53(5):195-196. Moneruzzaman KM, Hossain AB, Sani W, Saifuddin M. Effect of harvesting and storage conditions on the post harvest quality of tomato (Lycopersicon esculentum Mill) cv. Roma VF. Aus J Food Crops 2009;(3):113-121. Mohsen K. Effect of Foliar Application of Humic Acid and Potassium Nitrate on Cucumber Growth. Bull. Env. Pharmacol. Life Sci 2003;2(11):03-06. Fathy MA, Gabr MA, El Shall SA. Effect of humic acid treatments on ‘Canino’ apricot growth, yield and fruit quality. New York Sci. J 2010;(3):109-115.